Does this web site work? Which pages do you like? Awarded by AJCF - promoting awareness of Cystic Fribrosis. I enjoyed my time looking through your creation. Your theme, background, navigation, and purpose are in good balance. I appreciate the time involved in presenting a wonderful website like yours and the knowledge you share. 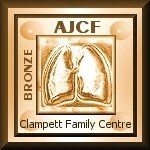 It is a pleasure to present you with the AJCF Bronze award. I wish you all the best. Congratulations! I am pleased to award your site both of my genealogy awards. I found your site very appealing and an asset to the genealogy community! Keep up the terrific work!! that you have met or exceeded all of our award requirements. We had a very enjoyable visit and we are appreciative of your efforts to bring quality viewing to the Internet. It is with great pleasure that I give you this award. Your Family History and Resource center is a wonderful resource for the family historian. After reviewing your website, I am proud to announce that you have won the "Genealogy Sleuth Award for Excellence". Keep up the wonderful work! Thank you so much for inviting me to visit your lovely website.... LOTS of information and so well organized. a genealogists dream! You have obviously put a lot of time and effort into it's creation and it shows! It's people like you who are willing to go that extra step and share your findings is what makes the genealogy community so wonderful. Thank you, not only your toil, but also your willingness to share your research with the rest of the world! please accept this award from Connie's Family History pages in acknowledgement of a 'job well done'! Thank you for inviting me to visit your site, I enjoyed it very much and would like to present you with our "Keeper of the Souls Award." I have been to your site and what a wonderful site it is. Your talent, hard work and heart are shown throughout. May the echo's of your own heart bring a smile to your face. We applaud your site's ease of navigation, obvious hard work, and invaluable content. It is with great pleasure that we give you the "Genealogy Award." Your site has been carefully evaluated and our judges feel that it meets ALL of the criteria necessary to win the "Advanced Programming Concepts Web Development Excellence Award." Nice pull-down menu and mailing list registry. Consistent design and navigation.